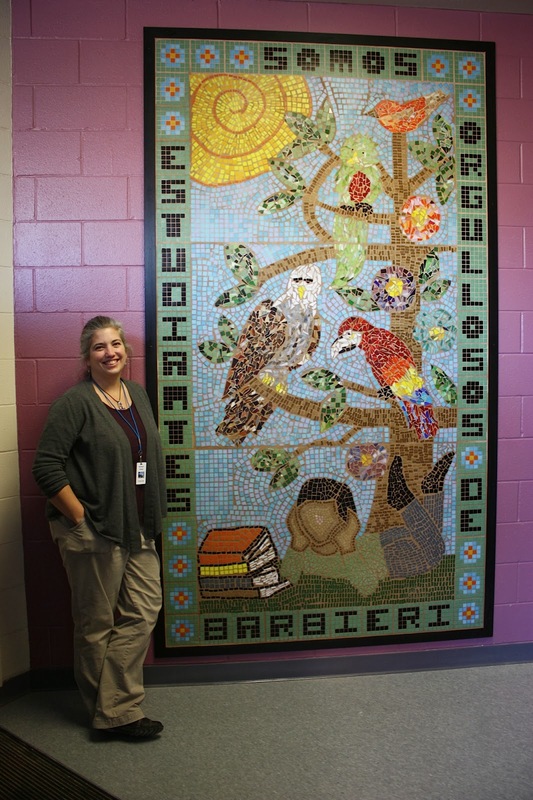 Barbieri Elementary School mosaic, Framingham MA. 2014. Collaboratively designed with original concept by Martha Fuentes, facilitated by Jeannette Brossart, created by 625+ students K-5th grade. 9' x 5', photo and assistance by Maria Enrique. "Somos Estudiantes Orgullosos de Barbieri" means "We are proud students of Barbieri", which is part of the school pledge which is recited each day. The tree is modeled after the Mexican Tree of Life, a ceramic craft tradition, the 4 birds represent the multicultural presence of this community (Bald Eagle/US, Parrot/Carribean, Queztal/Mexico and Central America, and Navarro Pirineo/Spain). The child is meant to represent "every child", not a boy/girl, not one specific heritage ("skin" tiles are in 5 different shades). The books represent learning and early education. The sun stands for Barbieri "CARE" values. Kindergarten students created the sun. 5th graders created the child and grass. One of the really great things about what I do is having the opportunity to collaborate with teachers in order to facilitate a mosaic for their school that is truly meaningful and exciting for that specific community of participants. For the Boston (Framingham) residency, I had the great fortune of being discovered by art teacher, Maria Enrique, who then was my primary faculty contact as well as daily staff support. She is an enthusiastic teacher and creative person, and was a pleasure to communicate and work with. She was able to coordinate concept and sketch ideas (thank you 2nd grade teacher, Martha Fuentes for your fabulous designs), keep up with my emails and distribute information as needed, receive materials ahead of the residency, and coordinate every class schedule to have time with me in her classroom for 2 weeks, whew. She had trust and faith in me that I knew what I was doing, and could actually facilitate this vision. I was happy to be able to show her some of the process like using the tile tape and spreading mastic, and she was on hand to help with cutting out patterns, tile tape, and talk through each group of participants and the groups she thought would work best together (classroom management). Other faculty, parents, and staff (thank you maintenance dept! ), were also instrumental in ensuring that I had everything I needed and that each day went smoothly. The administration team came to many of the sessions, and were able to understand and experience how their students were able to create this mosaic together. This is truly a collaborative process, and I am grateful to this sharing and welcoming community! Working mosaics with very young children requires small groups, patience, and some control. Sticking with simple colors and shapes keeps it from being overwhelming and ending up like tossing a bunch of colorful confetti up in the air and waiting for it to land. Directional lines help participants understand the flow or "andamento" of the design. Portioning out a large work so that the classes working on the last day have the same opportunity as the first day is very tricky. Sometimes adding an extra element (like a specific number of leaves on a tree, or flowers) enables this to work out more smoothly with a specific number of students/classes. Giving them some creative choices within the structure is important. As the participants age/skills increase, they are able to use a larger variety of colors, shapes, and more complex use of color like gradation and shading. Ten days ago on a frigid, snowy Saturday, I flew into Boston Logan airport and made my way West on Mass Turnpike to the city of Framingham MA to begin a two week mosaic residency. The project had been long in the planning, and many preparations had been made. I arranged to meet some of the school faculty and Cultural Arts representatives on Sunday at the school to be sure everything was in order and ready to begin with children on Monday morning. 625+ children (K-5th grades). Getting the design transferred to the (3) cement board panels, and holes pre-drilled was one of the first steps, as well as double checking and organizing the glass tiles. I took multiple square feet of many colors back to the hotel to nip that evening and for the next 5 evenings.